I joked to Donny, "Now if I could only find an opossum out here on the frozen pools I would be convinced to start year four." talked quietly and shot numerous shots. Daedee flew up almost to the road side trees and Donny got to see her up close. Dancer remained perched. I was hopeful I would at least get a glimpse of one of the eaglets from this past year. Twins that are nearing one year of age. layered sticks and pine boughs. Then I was heading back to the swans, but on my way I thought I'd pull over and shoot a couple frames of the new nest to compare it to the nest of today in a few weeks when I would officially start year four. I hadn't realized it yet, but I was half way through my first day of year four. Isn't it amazing how God can work details all around you, and someone like me, will miss every clue? As I neared the bend with the new nest I pulled over and focused my lens on the nest and found someone else. I found the owner of the new eagle nest. She was sitting on top feeding on an unknown food source. I was amazed. I was unsure of how this was going to unfold for this years book. Eagles so close they could breath on each other. I waited for an hour, hoping to catch a glimpse of her mate. No one joined her today while I was there. This eagle appears to be a female, however, I could be completely wrong. She is a large bird however; about the same size as Daedee. Her beak is deeper yellow. I named her Judy, after Donny's wife who first spotted the new nest. Maybe I would have found it too, maybe not. So I photographed up until nearly 2 PM and had to return to get my girl from school. So off I went, but who do you think I met when I passed Dancer and Daedee's nest area? He was sitting roadside looking up, almost begging for his photo-op. Nothing impressed me more than his pink nose against the dirty white snow, and those two watery-chocolate-brown eyes peering up at me. 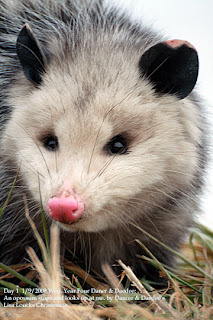 Then the opossum scampered into a woodpile and licked the water off the undersides of the shelf mushrooms there. It was a sight I will never forget. This entire day was a ticket, and my chapter opening to Year Four Dancer & Daedee. Tonight, I headed out to Wal*Mart and picked up some new boots, and video tape for tomorrow. Last year the day I started year three we hit a 20 day -45-50 below with wind chills and I this year I want warm feet. Inexperiece is a learning tool, but only when you learn. Don't you agree? 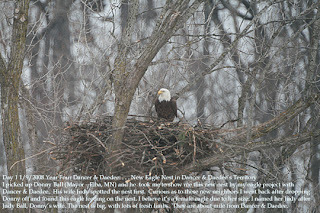 I'm posting the new eagle nest with Judy, and the opossum. I'll try and get Daedee and Dancer's pictures from today posted by tomorrow. If you are in Wabasha, MN, be sure to go to the National Eagle Center. I have two exhibits up there on their walls. My Winter Bugs! exhibit a traveling collection from my Winter Bugs! book and exhibit, and my Prelude to Year Four: Dancer & Daedee, my past three years with Dancer and Daedee the bald eagle pair raising their eaglets before me. I always appreciate your comments and prayers. Especially your prayers. Last year I went through a two day blizzard, and two major floods but got the story. Every year is something new. Every season a new challenge. Especially keeping photo gear working, and my clothes from tearing, cracking, and my computers from dying in the rain and dust. I feel good that God has blessed me this year, this new nest opportunity, and I'm anxious to share that with you.